Five-on-five it’s a tied hockey game. 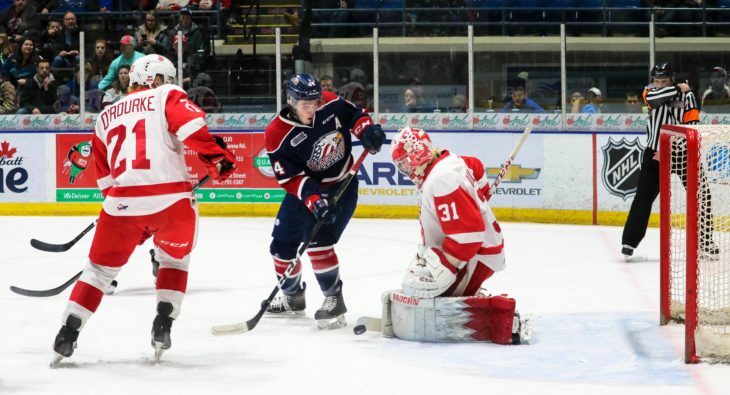 But when you factor in specialty team play, and a pair of empty net goals, the Saginaw Spirit drew first blood in the best-of-seven Western Conference Semi-Final series on Friday over the Soo Greyhounds. The Greyhounds came strong out of the gates in the first period and set the tone early on. While beginning to build their shot advantange that they carried all period long, it would be MATTHEW VILLALTA keeping the game scoreless just 2:30 when the first shot he faced at the other end of the ice was a breakaway attempt by Blade Jenkins that was stopped with a glove save. From there there the first half, and then some, of the opening period would see the Greyhounds on the powerplay and little in the form of 5-on-5 hockey. In total the Greyhounds had four man advantages, including a 5-on-3 for approx. 1:20 but were unable capitalize. In all of that Saginaw lost the services of Jake Goldowski who was assessed a five minute major for cross checking and a game misconduct. After allowing just 2 shots against in the first half of the period, Saginaw would increase that over the final ten minutes that included their lone powerplay of the period. On the late man advantage VILLALTA flashed the glove and denied the Spirit’s playoff leading scorer with a glove save. The Hounds outshot Saginaw 15 to 10 in a scoreless first period. Saginaw would open the scoring 1:34 into the second period when Reagan O’Grady feed from the left corner to Owen Tippet was one-time high stick side on Villalta for the 1-0 lead. That was the Spirit’s leading playoff scorer’s 6th goal of the playoffs. Before the period was five minutes old the two teams would trade chances. At one end BARRETT HAYTON was sprung on a partial break that was stopped as to where the Greyhounds secondary chances while at the other end Tippett came out of the corner and tried to out wait a downed VILLALTA. The Greyhounds netminder sprawled his left arm to keep the deficit at a single goal. It stayed that way just before the midway point as well when a play initially signalled for a Saginaw goal was reviewed, and subsequently waved off. Sandwiched in-between two powerplays, the Greyhounds would even the score while skating 5-on-5. And odd man rush saw KEEGHAN HOWDESHELL carry the puck over the line before feeding across to JADEN PECA who redirected the puck home behind Ivan Prosvetov. That marked Peca’s first goal of the post-season, while he had entered the game with 8 assists thus far. Saginaw outshot the Hounds 15-10 in the period, but overall the shot count was even 25-25 while the scoreboard was as well through forty minutes. The eventual game winning goal 8:21 into the third period. With Saginaw on just their second (and final) powerplay of the game, and a Greyhounds defenceman without a stick, Bode Wilde stepped into the circle to VILLALTA’s left and blasted a shot glove side to give Saginaw their second lead of the night. Two empty net goals by the Spirit (17:54 and then 19:00) would seal the deal for the home team as Saginaw took a 1-0 series lead thanks to the 4-1 victory. MATTHEW VILLALTA ended the night with 29 saves on 31 shots, good for Red Star Third Star honours. • Greyhounds’ scratches were 13 Roman Pucek, 18 Zack Trott, 19 Joe Carroll and 22 Robert Calisti; Saginaw deletions were 7 Ian Lemieux, 8 Caleb Everett, 11 Ethan Cardwell, 24 Brock Hill and 27 Danny Katic. 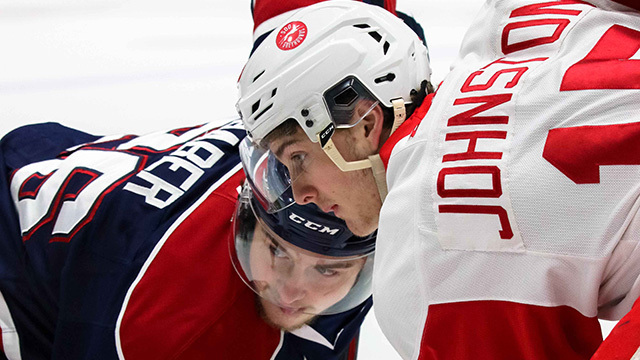 • Spirit forward Cole Coskey returned to the Saginaw line-up for the first time this post-season. The Zion, IL native missed the final twelve games of the regular season, and first four of the playoffs due to injury. These same two teams will meet for Game 2 of the Western Conference Semi-Final this coming Sunday, April 7th with the Spirit leading the best-of-seven series 1-0. Game time is 5:30 PM from the Dow Event Center in Saginaw, MI. Fans can tune into all the action starting with the Soo Video TV Pre-Game Show on Rock 101 (101.3 FM) or watch on Shaw Spotlight HD Ch. 353 or Blue Curve HD Ch. 624. Tickets for Game 3 (Tues. Apr 9) and Game 4 (Thurs. Apr 11) in Sault Ste. Marie are on-sale now by visiting the GFL Memorial Gardens Box Office during regular business hours of 10 AM to 5 PM Monday to Friday, 10 AM to 2 PM Saturday, 10 AM through game time on game days or online at www.gflgardens.ca or by phone at 1.866.775.9422. All twenty teams across the Ontario Hockey League will take part in the 2019 OHL Priority Selection presented by Real Canadian Superstore TOMORROW (Saturday). The online event begins at 9 AM. You can read further details on one of our previous stories HERE.